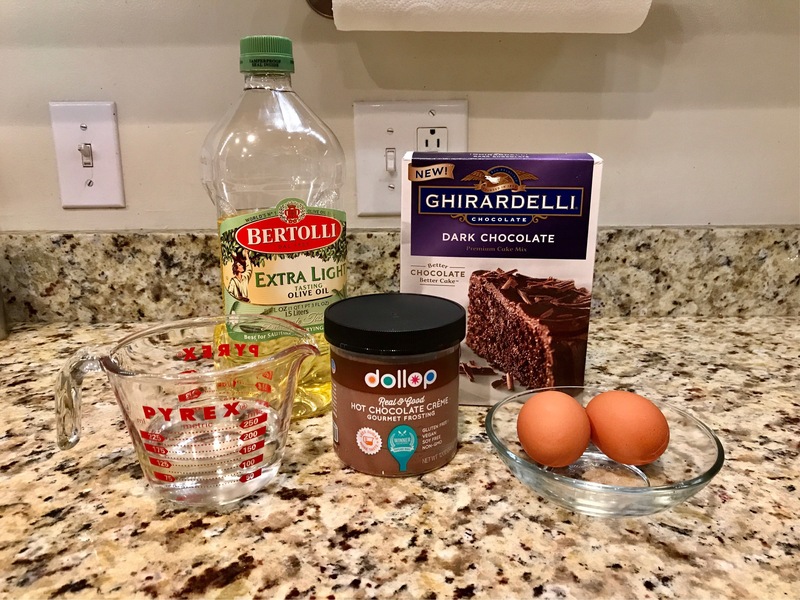 While I’m not normally one to use boxed mixes, I’d recently read a review praising the Ghirardelli cake mix and (clearly experiencing a craving for chocolate) decided to give it a try. I’ve been eating siggi’s yogurt for awhile now, since it’s one of the few with very little added sugar and high in protein. Most of the time I use plain and add my own fruit or granola, but their flavored yogurts are delicious! I LOVE the orange & ginger flavor the best, and their pumpkin during the fall. So good! Siggi’s is Icelandic-style yogurt, called ‘skyr.’ They use a whopping FOUR times the amount of milk for each cup of yogurt, which their gives it a very thick texture and more protein. When I found out siggi’s was holding a recipe contest for dietitians, you can bet I was super excited and couldn’t wait to enter. I even had to fudge a little on my ‘no-added-sugar’ challenge since the recipe is due April 30. I really wanted to make something unique (i.e. not a smoothie) with the yogurt, and was waffling between a baked item (like a muffin) and an Indian-inspired yogurt dressing for chicken when Andrew gave me the idea for cheesecake. (Not sure why–he doesn’t even like cheesecake!) Because siggi’s values real, simple ingredients and limiting added sugar, I attempted to make a simple (i.e. 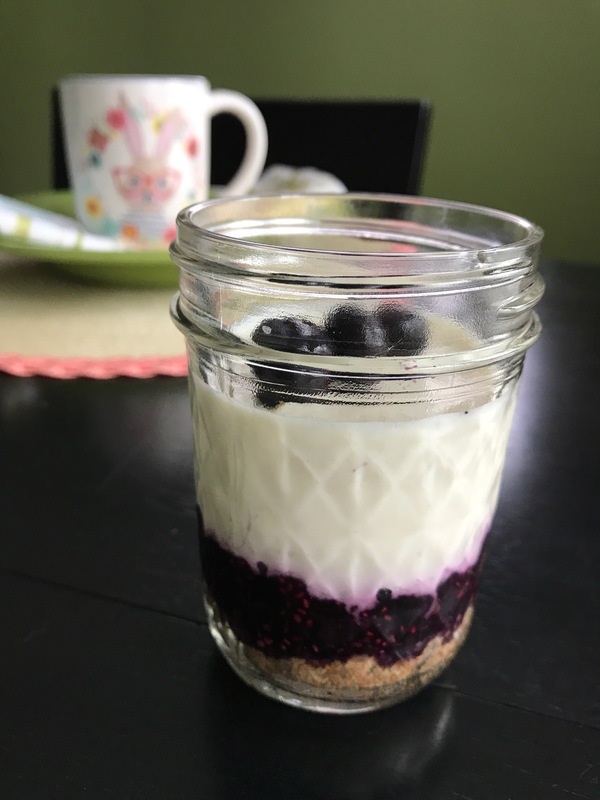 no bake), healthier (enter the yogurt) cheesecake without a lot of added sugar. It’s just sweet enough to feel like dessert, yet tangy and light enough to be kind to your waistline. Anyway, after a huge fail for the first version, I hit a home run with my second go-around. A big THANK YOU to the Nyes, who served as my taste-testers! Please note this recipe uses a variation of the cherry-chia jam I posted recently, so be sure to make the jam before you want to make and assemble the cheesecakes! Heat blueberries and pineapple juice over low heat and use a potato masher to crush fruit. Simmer 5-10 minutes. 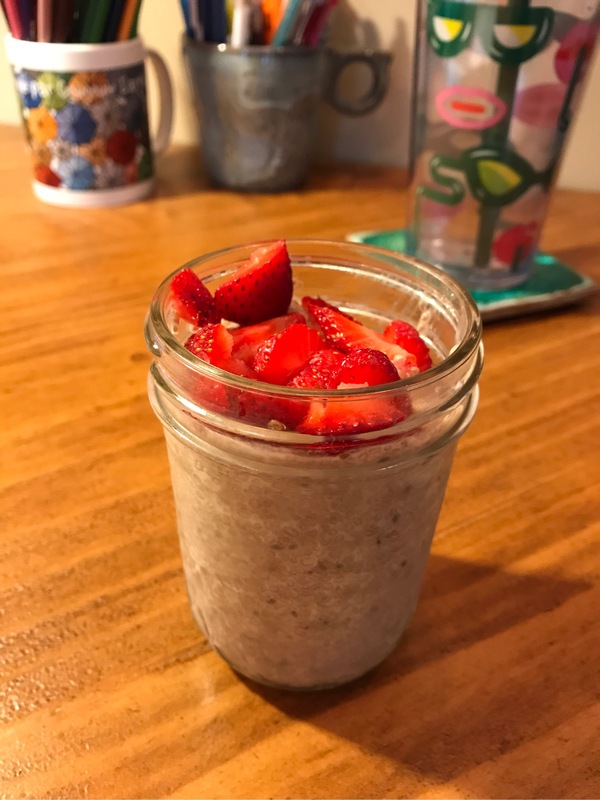 Mix in chia seeds and pour into a glass jar. Refrigerate 4 hours or overnight. Mix crumbs, butter, sugar and cinnamon together. Immediately add 3 T of crust to each ramekin and tamp down. Empty gelatin packet into a glass measuring cup, pour in 1 cup boiling water and stir until gelatin has dissolved completely. Let stand 5 minutes. Mix yogurt, cream cheese, honey, lemon juice and zest in a large bowl with a hand mixer or in a food processer until well combined. Pour in ½ cup of the gelatin and mix until smooth. Cool crusts in ramekins/jars if pre-baking. Spoon 2 T of blueberry jam onto each crust and spread to cover completely. Ladle approximately ½ cup cream cheese mixture into each ramekin/jar and refrigerate 3 hours to set. Top with additional jam or blueberries as desired. Disclaimer: siggi’s does not know who I am, nor am I being sponsored or reimbursed for this post.